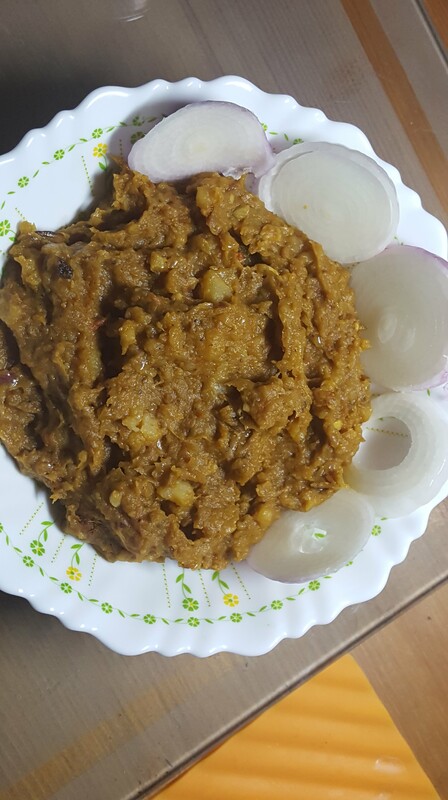 Baingan ka bharta recipe is the dish that is packed with flavor from rich onion, garlic, ginger, and tomatoes.Baingan ka bharta is a south Asia dish that originated in Punjab bearinga resemblance to baba ghanoush.Generally, baingan bharta make with brinjal but my mother adds little-mashed potato also, which makes it very yummy. Roasted and peeled and mashed the brinjal transform into an aromatic ingredient perfect to create a Punjabi subzi or curry. Grease the brinjal with mustard oil, make slits all over the surface at equal intervals and roast over an open flame 10 -15 minutes or till baingan turns soft while turning occasionally.Keep aside to cool, cut the stem and discard it, peel the skin of brinjal and mashed with the help of a masher.Keep aside. Heat oil or ghee in a pan, add cumin seeds when the seeds crackle add onion and saute2-3minute add the ginger garlic paste green chilis and saute 1-2 minutes on a medium flame.Add tomatoes,saute1-2minute add allspice mix well cook 3-4 minutes on medium flame while stirring occasionally. Add roasted and mashed brinjal and salt mix well and cook2-3minutes, while stirring occasionally. SERVE hot with chappati, paratha, naan, puri etc. TIPS: While buying brinjal for bharta , go for the ones which are light, because heavy brinjal have ripe seeds in it and this maybe spoil the taste of bharta.